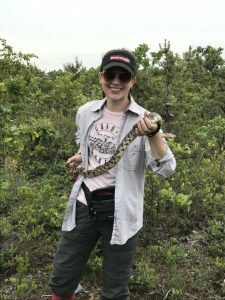 Let’s meet Sara…an Evolutionary Biologist who loves Herpetology! A typical work day for me, especially during the academic year, involves coming into my office on campus between 7:30 and 9:00 am. The first thing I always do is check my email and respond to anything that needs my immediate attention. My days vary from this point on and typically include some combination of the following: advising students, faculty meetings, teaching a class, going over projects and progress with my students and postdoctoral researchers, writing grants, conducting analyses, reviewing scientific papers for journals, working on my own publications, and supervising work in my laboratory. This also includes plenty of chatting with colleagues about all sorts of things, including research, university matters, and general chitchat. Other, but not daily activities include preparing seminar talks about my research, giving seminars at other institutions, reviewing grants, doing herpetological field work in both local (New Jersey Pine Barrens) and exotic places (Madagascar, Baja, Brazil, etc.! ), and going to herpetology and evolutionary biology conferences. What is the most enjoyable part of your career? My favorite aspect of my job is field work! I love going to an area and just looking for herps! The most challenging part of my job is probably getting grants funded. Funding rates for research are very low, and you need that money to do the research, so writing a grant proposal that may only have a 4% chance of getting funded is a frustrating aspect of the job. What childhood experiences sparked your interest in this career? Ever since I was about 4 years old, I can remember being very interested in animals and especially herps. I would spend weekends at my grandparent’s house in Pennsylvania and every Sunday we went for a walk in the woods somewhere local. My grandmother would always encourage me to look under rocks to find salamanders and snakes, and really fostered my love of nature from a young age. How did your science education help you realize your dream career? The type of job I have now, where I can for much of the time set my own schedule and work on research that I love requires a PhD; you can’t really be a university professor without one. So science education has been integral to my ability to have such an awesome career. What was your favorite science class in school and why? I loved all science classes in grade school, although I struggled with chemistry and physics in college. In college, my favorite courses were systematics, which is the type of evolutionary biology I specialize in and pertains to quantifying and qualifying Earth’s biodiversity (includes describing new species, determining how they are related to each other, figuring out the tree of life) and of course, herpetology! Which activities can help youth develop the specific skills needed to succeed in your field? For my field, pretty much every single thing listed has pertinence to what I do now! Examples – I give seminars (public speaking), I do lab work that requires following directions (cook following a recipe), I document herps I find in the field and include them in figures for publications (take and edit photos), I give talks to people of all ages, including kids (work with kids), I”m often in remote areas and hiking for hours and hours (stay physically healthy, spend time outside in nature), I use GPS and GIS to mark where organisms are found and make maps of their distributions (geocaching), I take field notes (take notes in school/4-H), I keep my lab well-organized (keep a tidy room)…I could continue, but all the activities listed really are useful in some ways of my job! Computer coding (many analyses I do rely on programming languages). 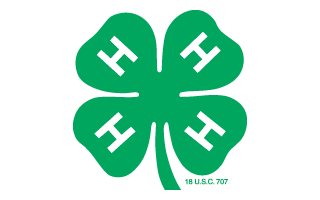 Any additional advice for youth interested in your field? If you have passion for something that might seem difficult to make into a job…do some research on it and see what is out there! For example, if you like herps (or any animal), you aren’t limited to being a veterinarian (which is what a lot of people usually think of when they like animals). You can work in government for conservation management, you can do research at a university, you can work at a natural history museum, you can work at an environmental consulting agency that surveys for herps…the possibilities are broad and not limited to a single career.